The developments come a day after three legislators resigned from the party and joined the Bharatiya Janata Party. Amid late night reports that the Congress party flew out 44 of its legislators to Bengaluru from Gujarat, three more of the party MLAs resigned Friday taking the number of legislators who quit to six, ahead of the Rajya Sabha polls. The party has fielded its heavyweight Ahmed Patel for the RS polls. The erosion from its legislature party has cast a shadow on the fate of Patel as his party has to zealously guard against further desertion of MLAs to ensure his victory in the election due to be held on August 8. Patel, 67, is the political secretary to Congress president Sonia Gandhi and has been re-nominated by the party. Besides the six legislators who already quit, two more MLAs have threatened to severe ties with the party. 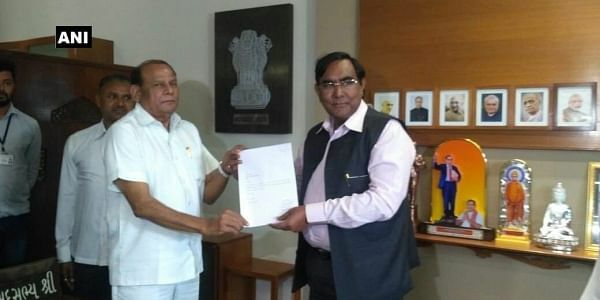 Mansinh Chauhan, the Congress MLA from Balasinor in Mahisagar district, handed his resignation to assembly speaker Ramanlal Vora in the morning. Chhanabhai Chaudhary, party legislator from Vansda in Navsari district, gave his resignation to the speaker at the latter’s residence Thursday night, while Ramsinh Parmar, MLA from Thasra in Anand district quit Friday from the Congress party and as MLA. With this, the Congress’s tally has come down to 51 in the 182-member assembly. Thursday, three party MLAs, considered to be close to Vaghela, quit the Congress and joined the BJP, which quickly declared one of them its candidate for next month’s Rajya Sabha polls against Ahmed Patel. The Rajya Sabha Friday witnessed noisy protests with the Congress alleging that one of its Gujarat MLA has been abducted by the state police and the BJP retaliating that the main opposition is trying to malign the state. The issue led to repeated adjournments in the house with the Congress members resorting to sloganeering against the Centre to ‘stop killing of democracy’. Minister of state for parliamentary affairs Mukhtar Abbas Naqvi demanded an apology from the Congress for defaming the state. “The Congress is trying to defame Gujarat. They cannot keep their MLAs together and are blaming the state government for it. The Congress should set its house in order rather than blaming others. They need to introspect why the party is losing every election and what can be done,” said Naqvi.